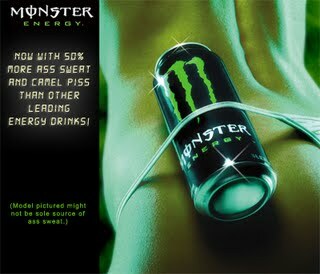 Monster Energy Drink’s lawyers seem intent on living up to their product’s monster name. Since I consider frivolous legal conduct to be within my wheelhouse, and this evening being Halloween eve, I thought I would look at the monstery conduct of Hansen Natural, the billion dollar company that makes this brew. Overall, the taste was weird and I don’t think I’d want to drink this again. No problem, right? Except that their chief legal eagle, Darlene R. Seymour tried to scare the crap out of this little web site by threatening them with a lawyer letter. Perhaps she missed the class on that First Amendment thingie. The web site posted the letter, apparently telling Hansen to take the proverbial long walk on the short pier. And in another attempt at making its name synonymous with evil, the billion dollar company sent a cease and desist letter to the tiny Vermont Rock Art Brewery for trademark infringement for making Vermonster Beer. Hansen thought there might be some confusion in the marketplace, despite the fact that they don’t even make beer. But that didn’t work out so well either, as the brewer fought back with a viral marketing campaign including a YouTube video hit. The owner went with the Web Defense under the assumption that the legal defense, while clearly winnable, would bankrupt his tiny brewery. So instead of waiting for the economic end game to hit him, he went after the giant. In one of the great David v. Goliath battles of the web, which ended with a fast win for the brewery, the brewer turned the tables on the mega-monster when Hansen distributors started to boycott Monster Energy. Instead of punishing the brewer with legal fees, Hansen was now being punished with its products being pulled from shelves. And others chirped in that, by the way, their stuff tastes like camel piss. Welcome to the web, Hansen. Where are those lawsuit reform groups when you really need them? You know, such outfits as Citizens Against Lawsuit Abuse that are always squawking about “frivolous” lawsuits and demanding new laws to prevent people from suing big corporations. All of this got me thinking. I seem to remember a lot of monsters throughout history. These monsters have no problem with Rock Art’s Vermonster or Monster energy drink co-opting their name and hopefully when they call for a jury of their peers, some of them will sit on that jury. Chance are that you’ve seen ads, letters-to-the-editor, op-ed pieces and other materials put out by outfits with such civic-sounding names on Citizens Against Lawsuit Abuse. By whatever name, the message is always the same, usually delivered in a sort of urgent, basso profundo voice saying something like this: “Bloodsucking lawyers are constantly filing frivolous lawsuits against beleaguered corporations. I would predict an outcome in favor of Rock Art. The fact is, Hansen is far from the first to use or register a MONSTER-formative mark for beverages. Perhaps you think my comments may lead to some confusion in the marketplace as to your actual ingredients. But that’s unlikely, since I don’t presume that readers of this blog are total morons. I know that I shouldn’t have to explain that to you, and that is should be readily apparent to all lawyers (and in fact, everyone that made it out of high school), but you guys do seem to need a bit of help in that department. Hi Eric – great post and thanks for linking to my blog. I’ll watch yours and look for a good opportunity to reciprocate!